There are many friends of House of Q that will visit the Earlybird RV Show in Abbotsford, BC from February 14-17 at Tradex Convention Centre. Greek Stuffed Mushrooms – Click on the picture to see the recipe. If you are an RV-er or you are a regular out camping, there are cooking challenges. Some people willingly take on these challenges and think of them as easy hurdles. It might take a bit of determination. Others, on the other hand, would rather have pizza delivered that use the tiny gas oven in their mobile kitchen. BBQ Brian Misko has been a warrior of the road. Not necessarily visiting campgrounds or cooking in RV stoves but outdoor cooking for sure. In most instances he is in a parking lot somewhere in Canada or the USA. He is the Pitmaster and leads his team at competition BBQ events. The team’s list of awards is lengthy but as he says “I like to think about what we ate as kids… what did mom cook and what do I remember about my Grandmothers kitchen?” Those are the moments of inspiration for modernized recipes for RV-ers like Mom’s Stuffed Peppers and Greek Stuffed Mushrooms. At the Earlybird RV Show BBQ Brian will be presenting on stage his best tips and experience cooking in tight and as some might describe, awkward places. One session will focus on “stuffing” things like peppers and mushrooms. The recipes that he crafted are posted on the Earlybird RV Show website and can be found here. The key thing about these recipes as he describes is that “they are adaptable to use what you have on hand in the campground or what you can find at the local grocery store. 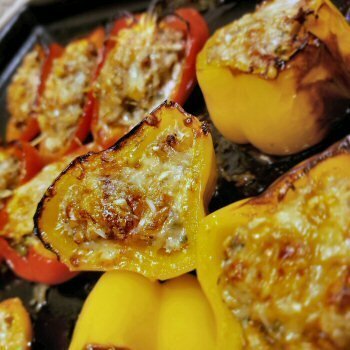 The dishes are easy to do, can involve the young ones if they are around and can be cooked IN an RV oven.” Stuffed peppers and mushrooms are easy to cook on an outdoor grill as well. Mom’s Stuffed Peppers – click on the picture to see the recipe. The second session at the show will be about steaks. This has to be one of the most popular items on many grills both while out camping and at home. The dish is rather straight forward… a grill, fire and meat. How more primal can a task get? However there is so much to learn when you get down to it. BBQ Brian will share his tips on selecting steaks, aging, the right fire, how to prepare them and more tips than he can cram into short trade show session. See you at the show, or at the campground but either way, make something tasty!